Even though Pinterest can’t completely replace a brand’s online marketing program, a strong presence on the visual web service can support and even uplift most companies’ online marketing efforts. Consumer surveys suggest four reasons why shoppers feel comfortable connecting with brand representatives on Pinterest instead of through other online communication channels. 1. Pinterest’s interface matches the way we shop. Although two out of five shoppers follow links from social media services to company websites, those clicks rarely result in sales. Amazon soared to early success with “wish lists,” a feature that most e-commerce websites soon copied. Third-party Facebook apps offer wish list functions, but dubious privacy and affiliate marketing policies have prevented any from breaking out over the past few seasons. However, Pinterest stumbled on a near-perfect implementation of the form, making it easy for web surfers to collect visuals of their most-wanted gifts. 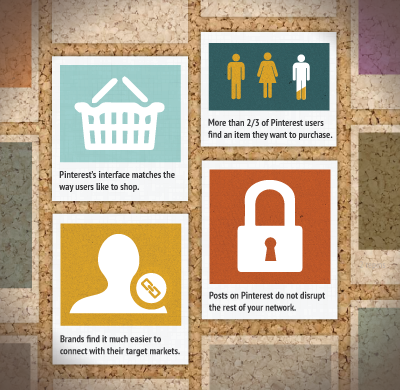 Pinterest’s private boards enable shy shoppers to keep lists quiet, sharing them only with a few accomplices. 2. Pinterest is a casual, safe environment for advice. According to research conducted by Prosper Mobile, more than half of American women now use their smartphones to research potential purchases. BizRate surveys show that more than two-thirds of Pinterest users find an item they want to purchase on the social network. Combine the lack of a text-heavy interface with the ability to take your social networks anywhere, and the visual web has made it easier than ever for women to get high quality information from trusted sources online. In such a casual, safe environment, consumers feel far more comfortable about asking brand representatives for advice. 3. Posting images on Pinterest doesn’t disrupt the rest of your network. Ask what Twitter’s really “for,” and you’ll get plenty of different answers. Some users love lots of images, while others seek only conversations in their threads. Facebook’s status updates have become so fractious, the service has rolled out numerous algorithm changes and settings tools that let users filter out types of posts they don’t want to see. Pinterest, by definition, thrives on visuals. Brand fans enjoy seeing a variety of perspectives on products they love, explaining why mixes of official and crowdsourced images show up on effective company Pinterest boards. 4. Pinterest’s community reinforces our shopping decisions. 70 percent of online consumers use Pinterest to get inspiration for future purchases, according to BizRate. Pinterest isn’t just appealing to women, either. Mercedez-Benz and Audi have reported success with their efforts to cultivate more male audience members on their boards. With the opportunity to see their own picks echoed and refined over time, shoppers can benefit from more authentic advice and guidance directly from brand representatives. Your customers feel more comfortable than ever connecting with you on the visual web, but only a comprehensive study of your online presence can show you whether you’re getting the right return on your investment. Contact our team today to find out how Curalate’s marketing suite can ensure that you’re spending the right amount of time building the best possible relationships for your brand.